If you ask someone to rate their driving skills on a one to 10 scale, there’s a good chance they’ll give themselves an above-average rating like a 7. Psychological scientists Michael M. Roy of Elizabethtown College and Michael J. Liersch of New York University found that although people may rate themselves as above average, they don’t think others would quite agree. 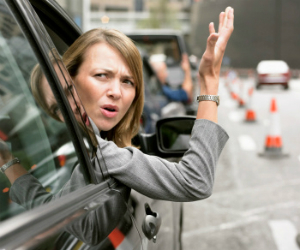 Across four experiments, Roy and Liersch found that people often believed that others would rate them as a worse driver (about 10% worse) than they rated themselves. Because there is no standard definition for “good driving,” people tend to use their own unique, individual definitions. So, a slow and cautious driver could have a totally different definition of “good driving” than someone who likes to drive fast and aggressively. In the study, college students completed questionnaires asking them to rank specific driving skills, assess their own driving ability, and assess what driving skills were most important to them compared to others. As predicted, across all experiments participants believed that they were exceptional drivers—but only according to their own definitions of good driving. Participants assumed that others would rank important driving skills, like checking blind spots or using turn signals, differently than they would. In one experiment, people thought others would rank only two out of seven driving skills as the same importance as them. Even when participants were provided with clear definitions for good driving behavior from the National Safety Council, they rated their own individualized definitions as better. The discrepancy between self-ratings and the ratings of others only disappeared when participants were explicitly told to use the expert guidelines as the basis for rating driving behavior. The results of this study suggest that even though drivers are aware that others are using different standards for good driving, people often view their own standards as superior. This could help policymakers design more effective interventions for decreasing dangerous driving behavior. I don’t think it’s so much the driving skills have gotten worse as much as peoples lifestyles are changing drastically. People (drivers) have too much on their minds. Day to day challenges such as jobs, taking care of their families, problems as home, fights with their spouses, boyfriends and girlfriends. People are just too preoccupied these days and don’t pay as much attention as they should. Cell phones and text were around 100 years ago? Dane, if a person is THAT stressed out, then they need to do something about it. Otherwise, it is no one’s fault, but their own. If you can’t take care of a family, then don’t have kids or pets. Have calm discussions with your spouse instead of yelling at them. Drop that boyfriend/girlfriend who’s only bringing you down. People have a lot more control over their lives than they make it seem. Which one of those things, exactly, do you think is new? This may explain the contrasting views of drivers and pedestrians on the lanes that lack pavements in my area. I suspect the drivers are confident (justifiably?) of their own and their cars capabilities. The drivers think nothing of driving fast and/or close to pedestrians, or braking sharply if they can’t pull-out to pass a pedestrian due to on-coming traffic. They appear to see success as “not hitting the pedestrian”. The pedestrians are scared by the driving behaviour and believe the driving is very dangerous; and the police need to enforce better behaviour. I think it may be similar to the expert archer hitting the apple sitting on the head of a member of the public. The archer has skills and has done this successfully many times before – the archer it is a simple no-risk act to hit the apple. However, the member of the public may be close to the point soiling their pants with fear because this may be the day the archer makes a mistake. My grandfather used to say just because one has experience does mean it was good experience. I noticed most people who say people can not drive do cut in front of other people driving, follow to close, do not use turn singles, speed and so on lol. Just because people that drive safe unlike them does not make them bad drivers.